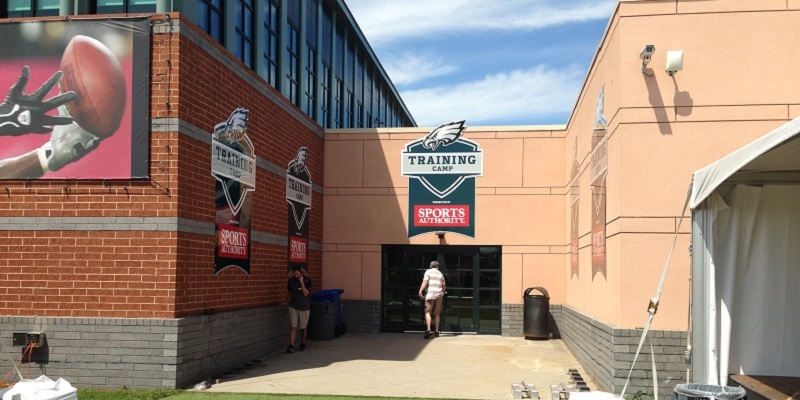 Two weeks of training camp are done, and Chip Kelly‘s Eagles play their first preseason game against the Indianapolis Colts on Sunday. Meanwhile, injuries are starting to accumulate. Kelly plays it safe, with no tackling to the ground at all in the preseason outside of actual games, and the team is making great efforts to handle inevitable injuries with its “reconditioning” program, which I describe in detail in my book Controlled Chaos. At the same time Kelly, as general manager, has bet heavily on being able to acquire talented players with injury issues and keep them healthy. It’s way too early to tell how that gamble will play out, and the result will largely determine if this season (and Kelly’s coaching career) is a success. 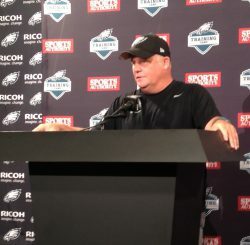 Chip Kelly explains it all to you. Rookie cornerback JaCorey Shepherd tore his ACL in a collision with Darren Sproles. You could argue that’s no big deal since he was a 6th-round draft pick, but Shepherd was a standout in OTAs and training camp. He was penciled in to start at nickel corner in place of Brandon Boykin, who was traded for a draft pick (in large part because of Shepherd’s promise). Now the team must figure out the next best option — Jaylen Watkins, the versatile 4th-round pick from 2014, UDFA rookie surprise Denzel Rice, or the loser of the outside cornerback competition between 2nd-round pick Eric Rowe, who played safety in college, and veteran CB Nolan Carroll (who played a hybrid linebacker role in the Eagles’ dime package last year). ACL tears are largely matters of (bad) luck, and you certainly can’t blame safety Jerome Couplin‘s appendicitis or Kiko Alonso‘s concussion on the coaching staff, but both of those players have missed a chunk of training camp as a result. Sam Bradford and DeMarco Murray, on the other hand, have missed lots of games due to injuries in their careers, which is part of why the Eagles could afford them, and unless they stay healthy enough to play, Chip will draw a lot of justified criticism for his strategy of grabbing injured players. The results so far are not great, but it’s way too early to draw any conclusions. It’s true that Bradford has played every first team snap as QB without coming up hobbling at any point. But beat reporter Jimmy Kempski sees him as playing tentatively and absolutely not ready to get tackled by a 280-pound defensive end. 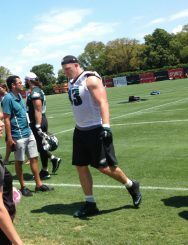 “The Eagles’ first preseason game is only four days away, and Sam Bradford has yet to make anything close to an athletic move with his legs through OTAs, minicamp, and the beginning of training camp. That would be 17 practices in total that have been open to the media. Offensive coordinator Pat Shurmur would not directly answer reporters’ questions about whether Bradford or Murray will play Sunday, but he hinted that they both might not. This makes plenty of sense for Murray, who had way too many snaps last year in a similar zone-blocking scheme and doesn’t need a ton of reps.
Bradford, on the other hand, hasn’t played much at all for two years and will have some serious rust issues whenever he returns. He was injured last year (ACL) in a preseason game after arguably being rushed back too early by his previous team, and it makes sense to wait until he is absolutely ready before risking his future in meaningless preseason action. However, the moment of truth will come sooner or later, and throwing him cold into a regular season game when everyone is hitting full strength might be an even bigger risk.